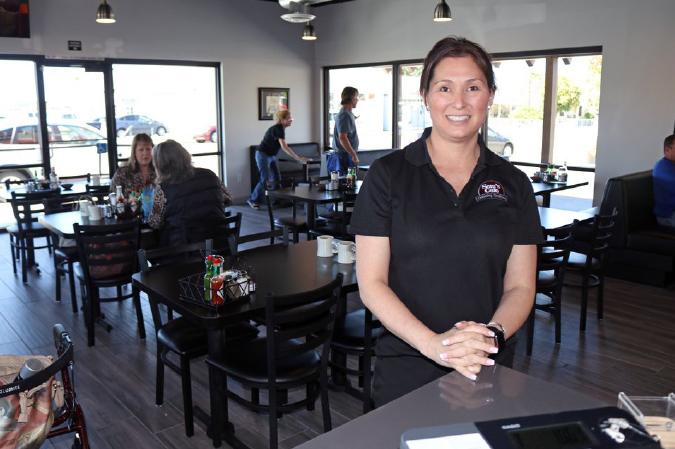 Sherrill McManus Petersen is happy about her newly remodeled Sam’s Cafe in downtown Ceres following 15 months of being closed due to fire damage. Sherrill Petersen’s world came crashing down in November 2017 when a fire charred her successful Sam’s Café in downtown Ceres. A roofing crew hired to fix a leaky roof used the wrong kind of torch, which set the roof on fire. The fire destroyed equipment and personal belongings and put Peterson and her crew out of work. After months of waiting and rebuilding, Sam’s Café had a soft opening in March for the first time in 15 months. All but one employee has returned to work at Sam’s. During the long process of insurance claims, building designs, building permits and rebuilding, the displaced workers temporarily found work at other restaurants in Modesto. Insurance covered two months’ worth of wages while a community fundraiser chipped in more assistance. Today she has double the waitresses and cooks. The café, located at 3052 Fifth Street, sports a new makeover that includes new modern tiling, $76,000 in new equipment and new booths and an additional door where there was none before. Petersen spent $20,000 of her own money to buy other items needed in the restaurant. For three weeks the faithful clientele would roll by and keep an eye on the progress in eager anticipation of getting back their favorite breakfast and lunch hangout. The process of rebuilding the former Hancock Auto Garage required a review of occupancy, door and window standards. A new door was added on the west façade for quick fire access and two new windows were cut into the southern wall made of masonry. The occupancy formula caused a loss of 21 seats. On March 17 she had six groups waiting outside for tables. Petersen has owned the restaurant for the past nine years although she was a part of it for 21 years as a waitress when it was Blondie’s and B&J’s Café. So far, the customers have been raving about the new digs and posting them to social media. Petersen said the town’s patience was proven again with problems that have cropped up, such as last week when the new air conditioning system sprung a leak on a customer’s head. A grand opening and Chamber of Commerce ribbon cutting will be held in April but until then the business is open 5:30 a.m. to 2 p.m. every day.